Color Corrector software for FCPX based on the vintage Videotek SDC-101 video hardware. ZDC-101 is a trio of modular color correction plugins that offer time tested methods of color grading,which are fine tuned to yield fast results. The open and flexible design also allows you to push color to the fringe and get unique stylistic looks. The design is based on an emulation of the classic hardware corrector, the Videotec SDC-101 Serial Digital Corrector. At one time, this box was used by nearly every post production house on the planet, yet strangely, very few digital plugins come close to the way it actually worked. Why load and render a bloated correction system when all you want is to desaturate? ZDC-101 is built into 3 distinct, smaller modules for optimum speed and efficiency.There are plenty of excellent color grading plugins out there, and certainly, you can pretty much achieve the same results through a multitude of pathways. 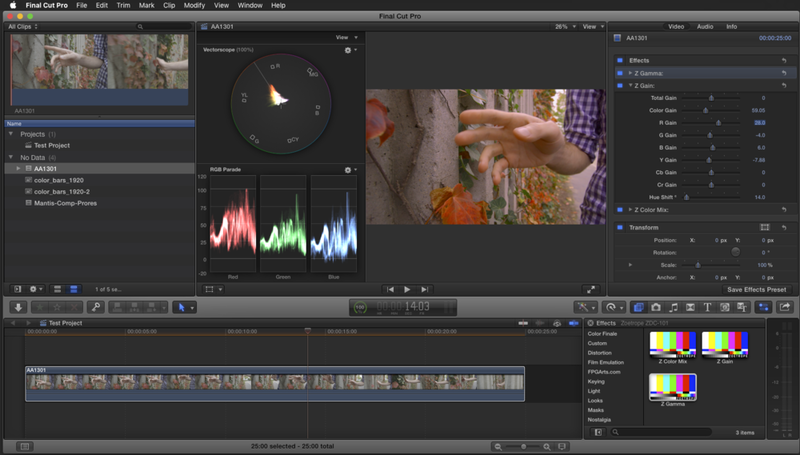 Try ZDC-101 and you'll see how fast and fun color correction can actually be! Z Gamma is the no frills approach for simple color adjustments in RGB space. 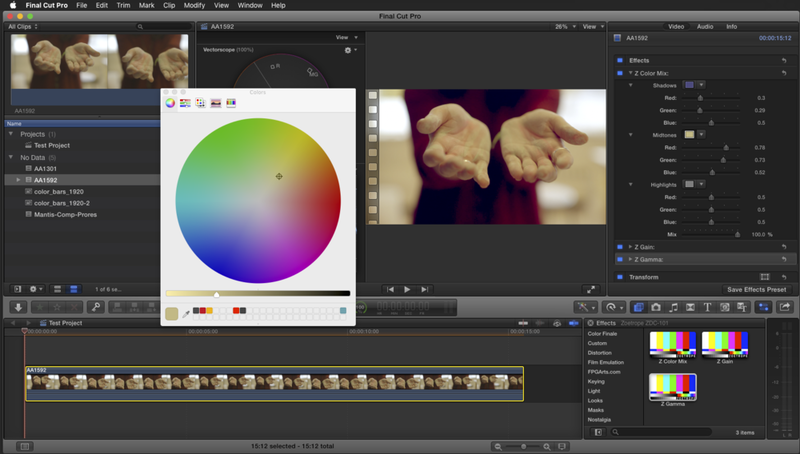 The sliders are nuanced for nudging the color in a certain direction. Its great for when when you just want things 'a bit warmer' or 'give it a little lift'. What makes Z Gain special is that it lets you adjust color gain parameters in both RGB and YUV colorspace simultaneously! 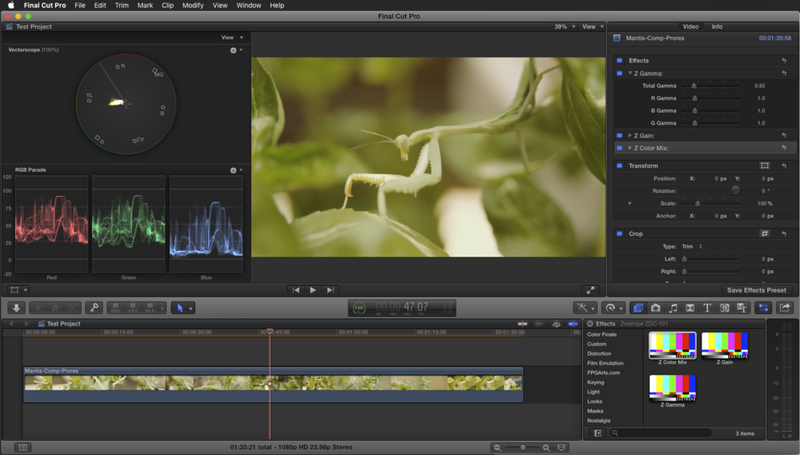 You also have access to master gain, color gain (saturation) and Hue Shift (in degrees). Brilliant in its simplicity, designed for the creative colorist, ZDC-101 leverages the Apple Color palette as an interface. This means you can choose the interface you want... RGB, HSL, CMYK, Greyscale, Swatches and yes even Crayons! That big color wheel gives you the finesse you crave. Eyedropper, check. Saved Swatches, of course! There is no need to re-learn anything here, you are already completely familiar with this interface.